Asthma is a chronic lung inflammatory disease that narrows the airways of the lungs and causes difficulty in breathing, trigger coughing, wheezing and shortness of breath. When we hear the word asthma, immediately the image of a person coughing or struggling for breath, along with searching for an inhaler comes to our mind. What not everybody knows is that asthma affects people of all ages and is caused by various factors. This means that a multitude of phenotypes have been identified, with different health management techniques being required for each one. Furthermore, for a large number of asthma sufferers, the first symptoms are revealed during childhood, and many patients live their entire life with this chronic medical condition. A wide range of asthmatic patients observe slight symptomatology for long periods of time, combined with short periods of time characterized by worsening of their asthma condition. These periods of a patient’s asthma getting worse can often be due to certain factors including the weather, allergens and intense activity. On the other hand, some patients also have major problems that interfere with their everyday life and raise the risk of severe exacerbations, or a worsening of the symptoms such that intensive treatment or even hospitalization is required. This is a situation that may lead to asthma loss of control in every moment. Although asthma cannot be cured, its symptoms can be satisfyingly controlled to ensure the best quality of life for asthma patients. To gain control over this chronic disease, it is highly important to continuously track signs and symptoms that warn for a potential upcoming exacerbation. Clinicians from three European medical centers (Leiden University Medical Center, Imperial College London, The University of Manchester) have joined efforts with internationally recognized researchers from the ICT domain (University of Patras, Centre for Research and Technology Hellas) and other stakeholders (medical private manufacturers, pharmaceutical company, asthma patients’ association, etc. – see entire project consortium) to implement myAirCoach project (www.myaircoach.eu), with a duration of 3 years (started on 1st of January, 2015) and funded under Horizon 2020 funding instrument of the European Union. MyAirCoach aims to create a technologically innovative mobile Health (mHealth) solution for the asthmatic population. The project target to deliver s unique personalized system, designed to face daily life critical situations, respond quickly to worsening of asthma and help patients understand what triggers an asthma attack and how to avoid it. The myAirCoach project is now entering its third and final year of implementation and the next generation mHealth system for the self-management of asthma is taking shape. A lot of progress has been made since the start of the project, and positive feedback the consortium is collecting from all stakeholders is demonstrating its value. This was also confirmed in all recent events and conferences such as the ERS Congress 2016, Mobile HCI in Florence, CeBIT 2017, eHealth Week 2017, EHB 2017; in addition myAirCoach’s interactive interface and innovative approach was acknowledged at the European contest Innovation Radar Prize 2016 with participation up to the finals. Health professionals urge asthma patients to monitor their symptoms through mHealth systems, taking into account that the improvement of medical adherence techniques has proven to result in better control of asthma. Regarding the term of medication adherence, lots of situations emerged over different illnesses and incidents which are not responding to treatment since patients do not always follow precisely the clinicians’ instructions, either by mistake or not. This means that doctors are not able to precisely know what is going on when a patient is not under their supervision, which may result in an inefficient treatment, for example increasing the dose or the frequency of medicine without any improvement. Concerning asthma medication, the basic problems encountered are either that the patients do not always take their medication seriously; or that the patients are not always using the inhaler (device for asthma medication) correctly and effectively. MyAirCoach proposes a novel mHealth tool based on a wireless body sensor network that will be the core element of a new approach to monitor and support asthma patients. myAirCoach project created a novel pressurized Metered Dose Inhaler adjusted with a Bluetooth microphone, paired with a Smartphone device which is able to keep a record every time a patient receives medication, as well as assessing in real-time the correct usage of the inhaler. The Smartphone application performs the usage analysis using sophisticated audio features, extraction and machine learning techniques. The system is trained to recognize four different types of sounds: inhaler actuation, patient’s inhalation, patient’s exhalation and background noise. The differentiation of these events provides useful information to the system, which in its turn can provide real-time advice whether a patient used the inhaler properly. The system has a precision of more than 96 percent accuracy in discriminating between the various stages of the inhaler usage, thus providing medical experts with sufficient data to improve and personalize their recommendations. A critical parameter on monitoring effects and symptoms of asthma concerns the understanding of a patient’s lung behavior. 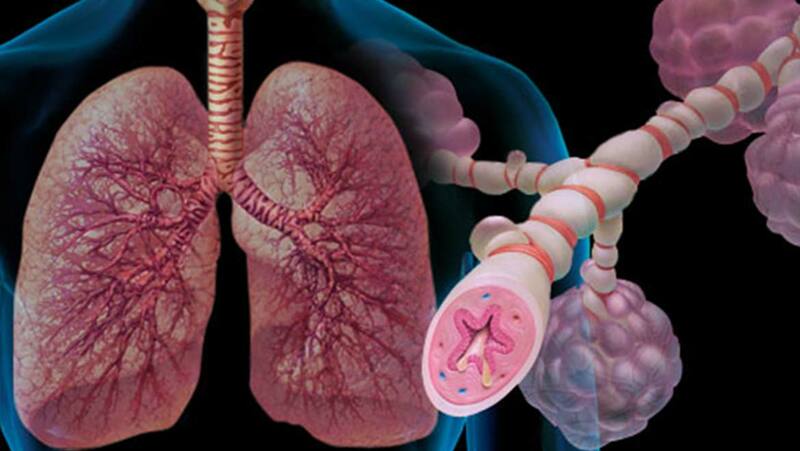 Discovering changes of the lungs’ morphology during an exacerbation can significantly improve the diagnosis or the assessment of asthma as well as any other disease that affect the lungs. A computational 3D lung modeling processing pipeline has been created to simulate a patient’s specific lung geometry. During a potential asthma exacerbation, lung airways are observed to unexpectedly narrow and gradually allow less and less air to reach the oxygen exchanging areas, a phenomenon known as ‘bronchoconstriction’. More specifically, the current geometric processing methodology allows the simulation of bronchoconstriction and the visualization of airflow in patient-specific geometry alterations. This methodology aims, at first, to create a model with the lung morphology for the assessment of asthma, based on MRI and lung function tests (tests that measure how effective your lungs are able to bring oxygen to the rest of your body) and subsequently to compare and contrast a patient’s lung physiology with a healthy person’s lung physiology and decide whether asthma is progressing, or how it is responding to treatment. These innovative elements were welcomed by the mobile heath and scientific community with extremely positive feedback. This indicates that the project has great potential and the consortium is going in the right direction. In September 2017, the myAirCoach system will start to be tested in a real life environment to determine whether it provides the clinical benefit of improvements in asthma control to patients with asthma. This is the final step towards a clinical validation and the eventual availability of the myAirCoach system to the patient and healthcare community. Lalos, K. Moustakas. "Energy Efficient Telemonitoring of Asthmatic Wheezes". In proceedings of the 2015 European Signal Processing Conference. Nice, France, 31 August- 4 September 2015.